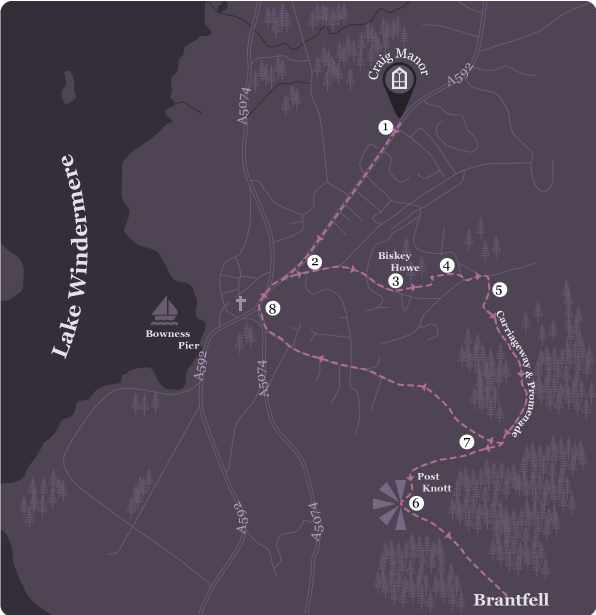 Trail description: This walk will take you through the beautiful village of Bowness on Windermere, up to the scenic Biskey Howe Toposcope and then onto Brantfell, for a stunning 360 degree view of Windermere. You’ll also travel along historic locations such as the Carriageway and Promenade stone benches and pass locations such as the World of Beatrix Potter. Trail Notes: Steep in places but mostly on roads and surfaced paths until the final descent into Bowness. Some parts of this walk are not suitable for disabled access. 1) Beginning at the Craig Manor Hotel, head to the right going downhill towards the village of Bowness, for approximately 460m. 2) Once you reach helm road (The World of Beatrix Potter shop will be on your right), turn left – keeping The Angel Inn to your right. 3) After the bend in the road following the Hydro Hotel, you’ll find a steep path (steps) that leads off to the left. This path ascends to the view point on Biskey Howe. 4) After enjoying the views of Biskey Howe, leave by the disabled track which is at the back of the viewpoint. Follow this path and cross the road through the gates marked ‘Deloraine’. Cross the next road and follow the sign ‘Permitted Path Post Knott’, which bears to the right through a gate with a National Trust omega sign. 5) Follow the Carriageway & Promenade all the way to the end (for information about the stone benches along this path, see “Points of Interest” below), then drop back to the gate onto Post Knott and climb to the summit for more spectacular views. 6) You now have two options: you can proceed along the path behind Post Knott going through the kissing gate and onto Brantfell, (for stunning 360 degree views of the lakes before returning to Post Knott) …or you can retrace your steps and go onto direction 7. 7) Following the path back to where it crosses with another signed Dales Way, turn left and descend through the field to Brantfell Road, heading towards Bowness village. 8) Once you reach St Martin’s Place you can either enjoy the rest of your day in the village centre or you can turn right towards Lake Road. This leads back to The Craig Manor Hotel. The path to this requires a little more effort, but the extra height leads to a fantastic 360 view. Brantfell has been the subject of a chapter in Wainwright’s book ‘The Outlying Fells of Lakeland’. It reaches 192m (629ft) and was commended by Wainwright for its “fin prospect of Windermere”. This location offers fantastic views across the whole of the ten and a half miles of Lake Windermere from Lakeside to Waterhead. There are plenty of stone benches along this old route, from the Hydro Hotel to Post Knott which was once used by those taking to the waters. /It was also designed to take the carriages of the seriously ill.